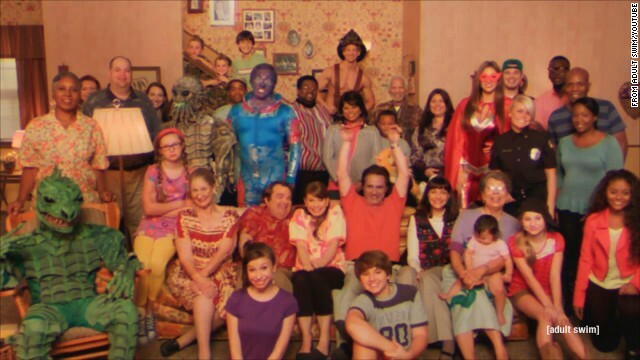 As you watch the video, the cast of "Too Many Cooks" continues to expand. (CNN) -- It debuted in obscurity on early morning cable TV and took off in a way that has "gobsmacked" its creators. The sitcom parody video, "Too Many Cooks," first aired on October 27 at 4 a.m. on Adult Swim, CNN cousin late-night network. The 11-minute video started making the rounds on social media after its creators uploaded the video to YouTube on Friday and it got a boost from Reddit users. "We made TOO MANY COOKS for Adult Swim and think the level of response is more surreal even than the thing itself," creators Casper Kelly and Paul Painter said on Reddit. What's fueling its popularity? It's hard to say, exactly, because there's a lot going on in the video. But for those susceptible to pop culture nostalgia it's hard to look away, despite the long run time. On the surface, the video is a parody of television intros from the 1980s, evoking quintessential motifs of the era, from sweater vests, side ponytails and tacky couches to twin actors playing a cute baby and an ALF-like creature named Smarf. The catchy jingle and ugly credit font bring to mind TV hits like "Growing Pains," "Perfect Strangers" and "Family Matters." As the video moves from one genre to the next, introducing more characters in cop dramas, sitcoms and a GI Joe-like cartoon, a machete-wielding serial killer emerges, and things just get weirder and weirder. Lars von Trier plays a pie? Where does an idea like this come from? "I've always been a fan of humor that just pushes things past the point of funny," Kelly told Rolling Stone. "When you watch those Andy Kaufman routines, or the old David Letterman bits where he keeps repeating and repeating a joke until it becomes banal and irritating -- and then eventually works its way back to being hilarious again -- that, to me, is the funniest. So the notion was simply, what if you had this credits sequence to a Full House-type show that went on and on and on..."
Whatever the appeal, it's drawing raves from Hollywood heavy-hitters -- and head-scratching from others. Too Many Cooks is so deftly engineered to unnerve stoned people in their mid 30s, it might actually have been created by the US government. Snarf was in my dream last night. I made it 2/3rds of the way through TOO MANY COOKS and started to have a panic attack. Will resume watching sometime tomorrow.